Why Aren't You Watching Kill La Kill? The Demon’s Rook is an indie fantasy horror film inspired by 80’s Horror cinema and partially funded via crowdfunding. 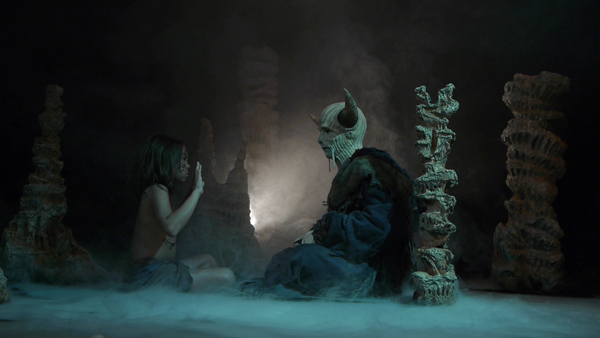 The film is co-written and directed by star James Sizemore and is the tale of Roscoe (Sizemore) who discovers a portal to another realm as a child and becomes the apprentice of Dimwos (John Chatham) a magic wielding elder from an ancient race of demons. Chaos descends on a quiet town when Roscoe unwittingly opens a portal allowing a malevolent evil to travel into the human world. A trio of fiends cross the threshold, one possesses the living, another raises dead whilst the third makes a man into a savage beast to do his will. With the trio laying siege to everything in their path it’s down to Roscoe to fight against the tide of evil. The Demon’s Rook which debuted at the 2013 Fantasia Film Festival before being featured at various film festivals is Sizemore’s feature debut. The trailer shows the lo-fi sensibility of Sam Raimi’s Evil Dead (co-writer/director Sizemore did the special FX and produced the film too) and runs with it being influenced by both the aesthetic of classic 80’s horror features like Lamberto Bava’s Demons and the amazing prosthetic FX make up which became synonymous with Italian horror features like Lucio Fulci’s Zombie Flesh Eaters. This approach contrasts massively with the film industries on-going love affair with computer generated FX. The Demon’s Rook will be released via Tribecca Film on iTunes and VOD September 30th. Check out the trailer which isn’t for the squeamish.